Farmer Cheese needs a healthy-ish grab and go breakfast on the weekdays. So I have prepared a sausage, bacon, spinach, egg and cheese combo for him. First I sauteed the spinach and then added cooked sausage and bacon and some cheese. Next I added eggs to the bowl and mixed it together. I put a half piece of bread in the bottom of a sprayed muffin pan, 1/4 piece for small muffins. Then I put the mix it the pans and off to the oven to bake at 375° for about 20-25 minutes. The small muffins that had silicone muffin liners turned out awesome. The bigger ones with the cooking spray stick a little. So I will be getting some larger muffin liners for sure! It’s a New Year: Meet Farmer and Mrs. Cheese! 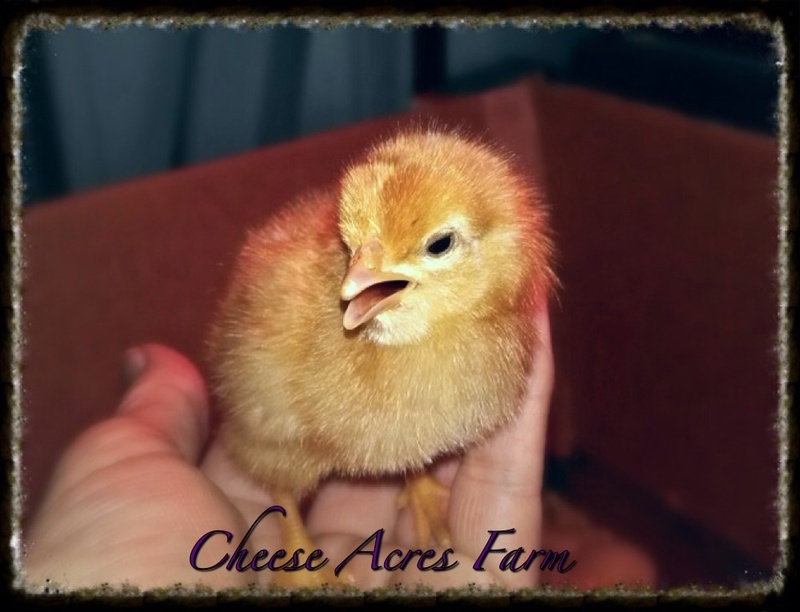 When Farmer Cheese and I started raising chickens 3 years ago this March, I don’t think either of us envisioned nearly 70 of them! The funny thing is we are adding more. We can’t keep up with the demand for eggs and we are so infatuated with our little feathered friends. Since our humble beginnings we have learned a lot. We have suffered losses, watched new life hatch and can truly say this is what we really want to do now. In addition to the chickens we garden to fill our freezer with fresh veggies. You will also find me in the kitchen canning and making jams and jellies in the spring and summer time. Earlier in December and last week we processed a deer for the freezer so we should have plenty of meat through the upcoming year. We made sausage, steaks, roasts, and ground some for hamburger. We feel an accomplishment at having done this ourselves. We are not nearly as self-sufficient as we’d like but we are working on it. Each day that we can spend less time and money in the grocery store is a step in the right direction. We would like to have milk goats and honey bees in the future. We are working as hard as we can to prepare a homesteading life to enjoy when we retire. Hopefully in a few more years we can both quit “working” and spend our time here on the farm. I’d like nothing better than to never have to set foot in a grocery store again! Of course there are some things a person has to buy but to become as self-sufficient as possible is our goal. Unfortunately now we both still work full-time jobs. 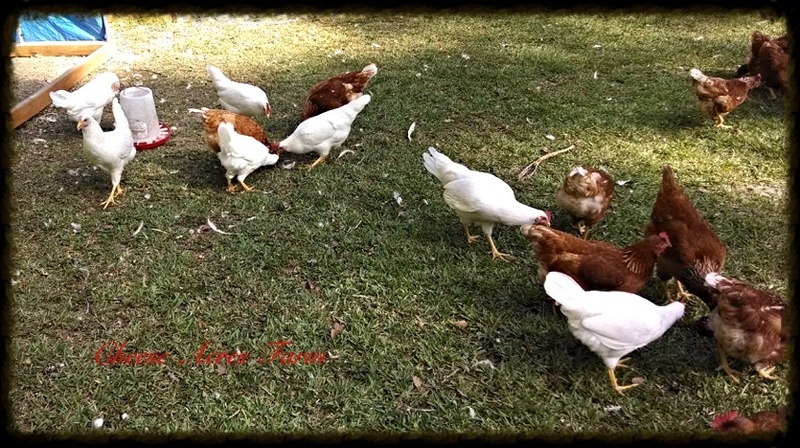 Then upon coming home tending to the gardens and the chickens is another full-time job. It isn’t easy making all this work but it is well worth it. One day we will be able to leave the working world jobs behind and focus on our homestead. Right now we are weekend warriors and work until dark or dark-thirty everyday, but we love our little farm. 🙂 Here is my little poetic thoughts on that subject. I hope you enjoy. And live content here in our homestead life! I absolutely love blueberries. Fresh, frozen, blueberry pancakes, muffins, cake, pie, and yes syrup too! In fact there is probably not a way to eat them that I don’t like. 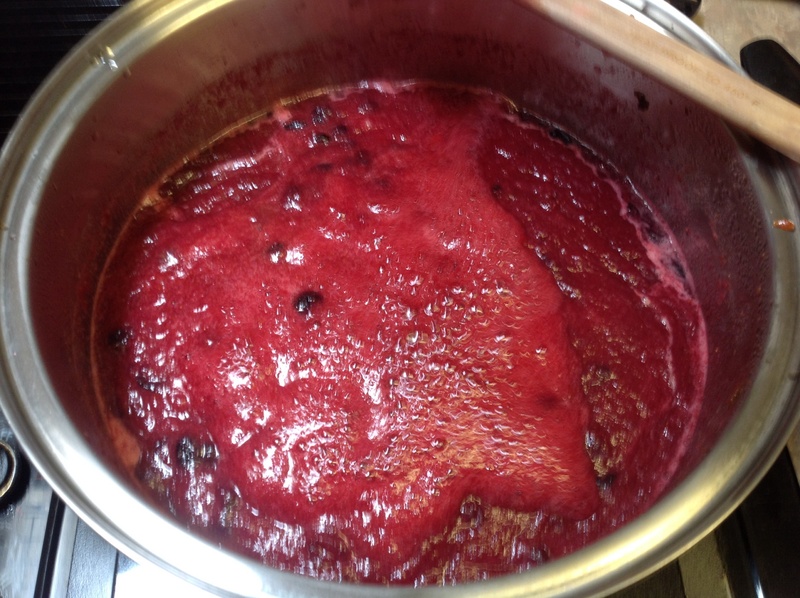 I have worked on my blueberry syrup recipe now for a few weeks trying to perfect it, well as close as possible anyway. I’ve gotten it as low sugar as I think I can and in a large batch for water bath canning. And trust me, it is so good! The next batch I make I will probably add another cupful of juiced berries and a little more sugar until I reach a full 7 pints. Stir sugar into juice and water. Add lemon juice and whole berries. Bring to a roiling boil. Turn to low and simmer for about 30 minutes or until mixture thickens. 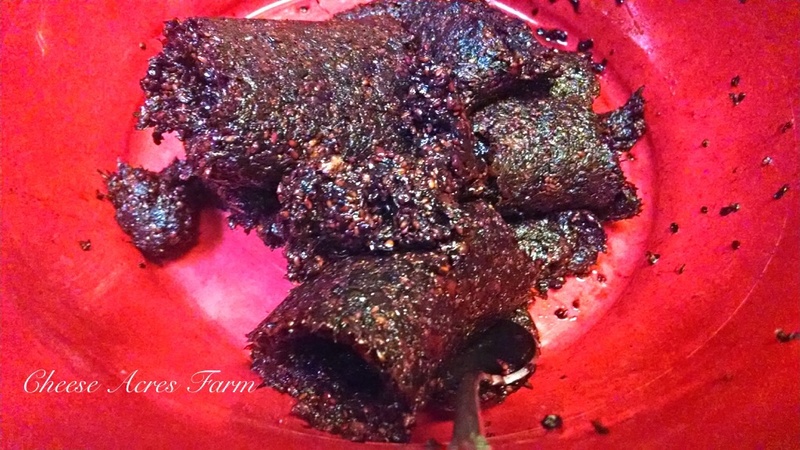 Ladle into clean jars and process in a water bath for 10 minutes. The 1/2 pint is great drizzled over a lemon cake, or right now for pancakes or waffles! 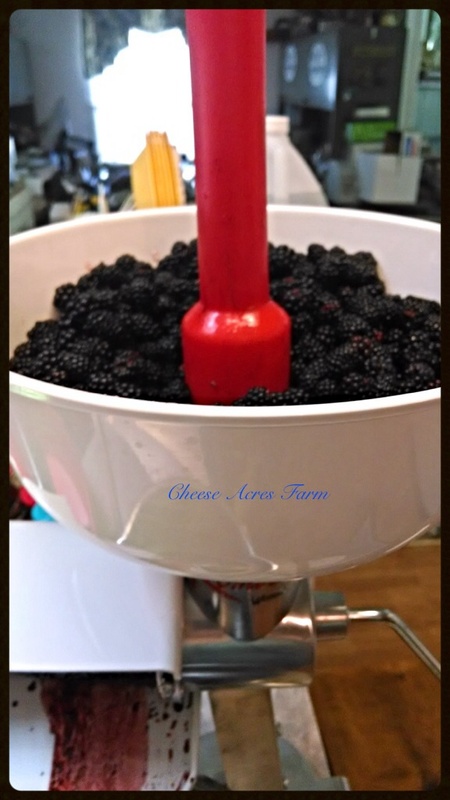 Making black or blueberry Jelly! Let me start by saying that buying my Roma food mill was the wisest thing I think I’ve ever done! 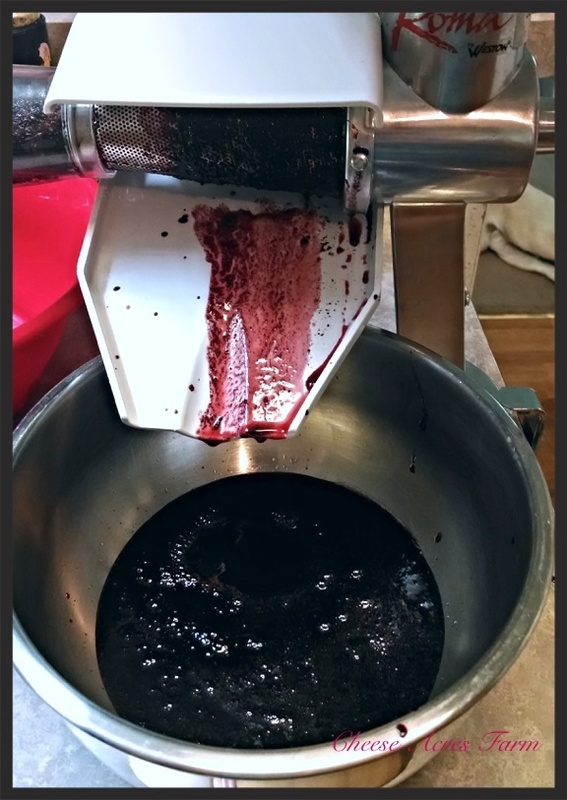 If you don’t have a food mill, I highly recommend one for getting the seeds out of those berries or for just squashing the fruits up a bit if you prefer. It’s also a great tool when canning tomatoes. 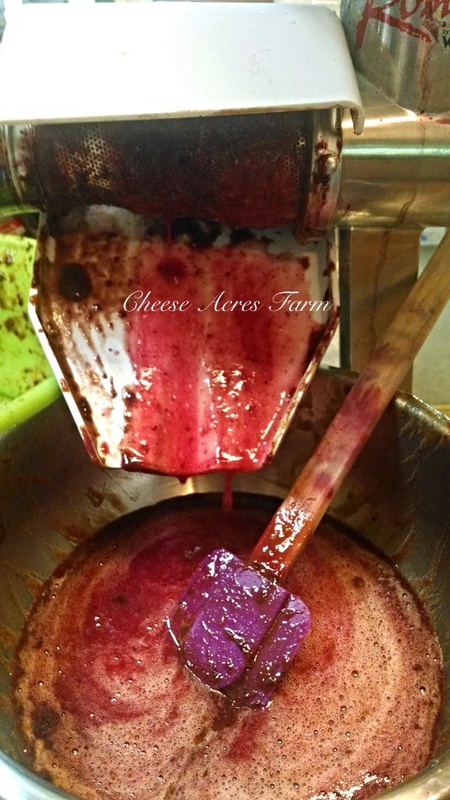 I always start my jelly making by of course washing the berries and then running them through the food mill. Here are some pictures of what that process looks like and what you will see left over. 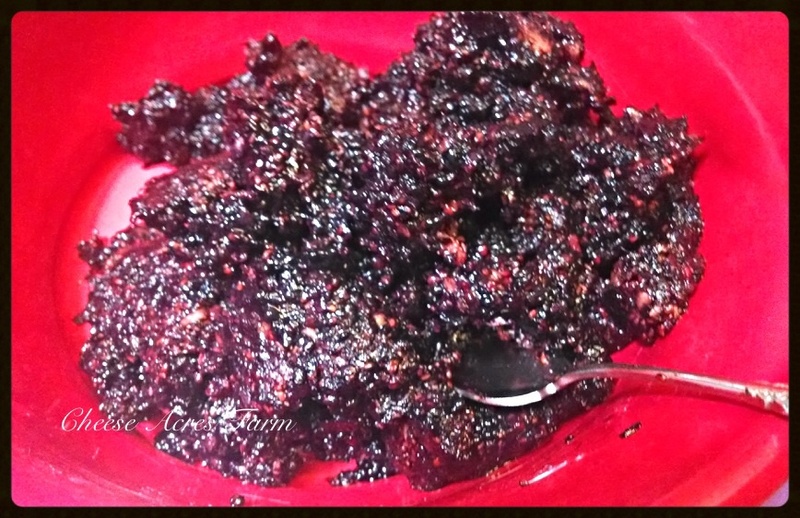 On this particular day I started with blackberries first. I repeat this process many times. As you can see in the last picture there is still a lot of juice after one time through. No waste here! I will run it through the mill 5-6 times at least. 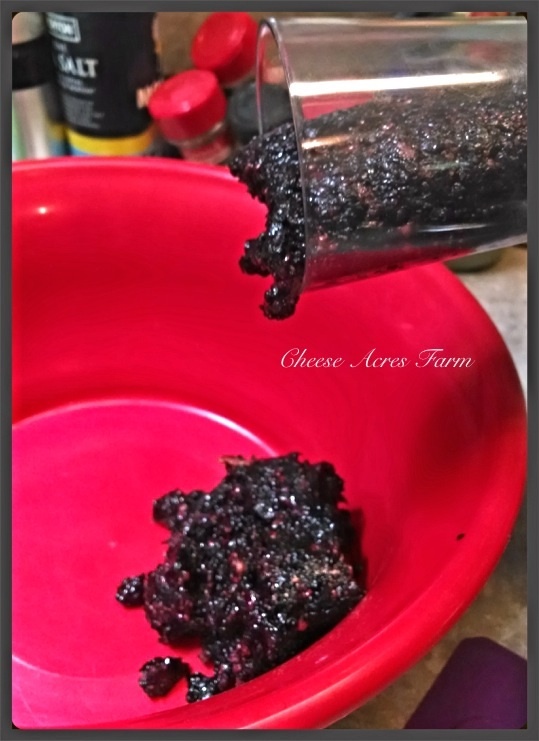 After getting the juice all out I can now go on to clean up a bit and repeat the process with my blueberries and store all my juice in the refrigerator and make jelly the next day. Or I can begin making jelly now. It really just depends on the time I have and what I have to do that day. Either way works just fine. On to the jelly making! The main point here is how much easier it is with a food mill. I’m not going to tell you one recipe is better than another but I will tell you that I use a lower sugar recipe and am currently experimenting with fruit juices to go lower and even no sugar. (3 cups is as little sugar as I could use without adding more pectin.) I will let you know how that goes! But this is the recipe I use currently. 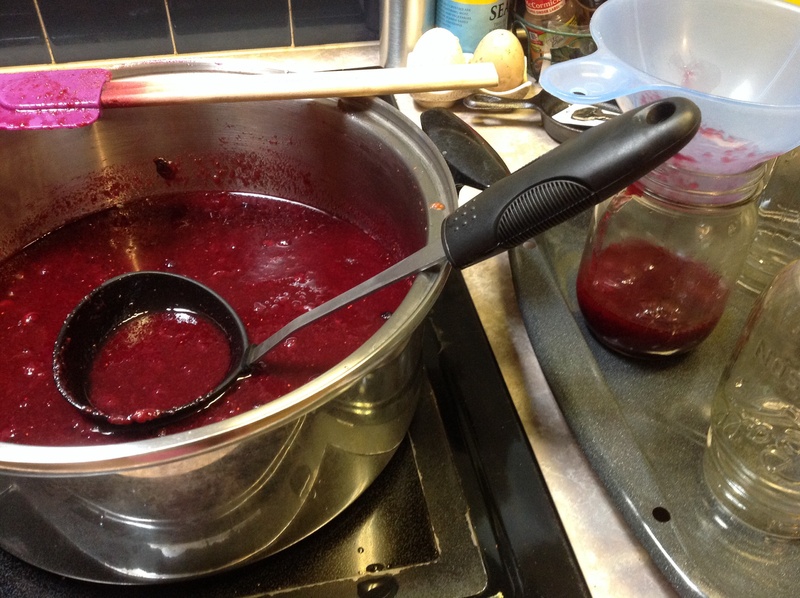 Place juice mixture in a large pot. Combine 1/4 cup sugar with 1 Tbsp pectin. Stir into juice mixture as you bring it to a boil. Add the remaining sugar slowly to reduce foaming. Bring to a second boil. Let boil for one minute. Remove from heat let stand 5 minutes and do a gel check. If it is the consistency you like funnel into jars. Process in a water bath 10 minutes. Helpful hints: Adding 1 tsp butter will help avoid foam. Wipe the top and rim of jars before putting on lids and rings. Don’t over tighten rings. Gel check: Put a spoon in a glass of cold water, dip a small amount of jelly out and let cool. Does it slide off or stay on? If it stays on and appears gel like, it’s good!